Using an API token generated by the user account. Using an OAuth application to connect to OnCrawl using the user's account. Both methods access the same API and have the same rights and restrictions. You will need to have a subscription that includes the OnCrawl API option. To have access to the OnCrawl API, you must first fill in this form to submit an OAuth2 application. Email: developer's email address, will be used to communicate about API evolutions, etc. The URL of the application: the logo that has been used for the application. This logo must be accessible from any website and served in HTTPS. Our application displays the resource directly in the browser. Default redirect URL: the default redirect URL is used when not specified by the application during OAuth flow. If you need to remove API access granted to an OAuth application, you can do that from your account page. Scroll down to "OAuth applications" and click on "View OAuth Applications". Then, click on the trash can to remove the API access for the application you no longer want to use. Here you will find the essential information you need to start up your application. We have taken care to detail key steps to follow in the implementation of your applications, use cases and details about each exchange parameters between your application and the API. It provides both a reference documentation, a set of guides and code examples that will help you get started with OnCrawl API. What is the OQL (OnCrawl Query Language)? All API requests are expressed in our OQL. This is an overlay of ElasticSearch for reporting / queries / live aggregations. 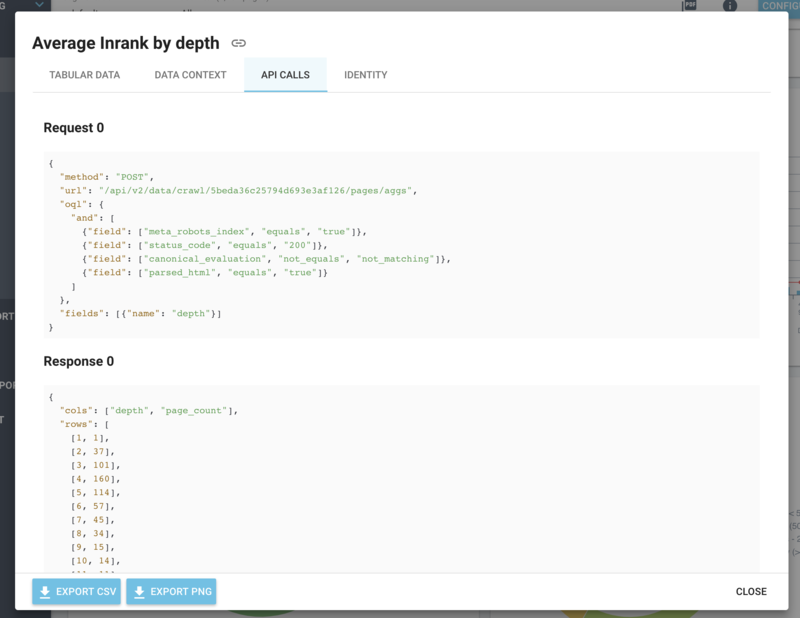 All OnCrawl chart include the API calls and the response format in the information about them. Click on the information symbol that appears when you hover over a chart, then navigate to the "API Calls" tab.